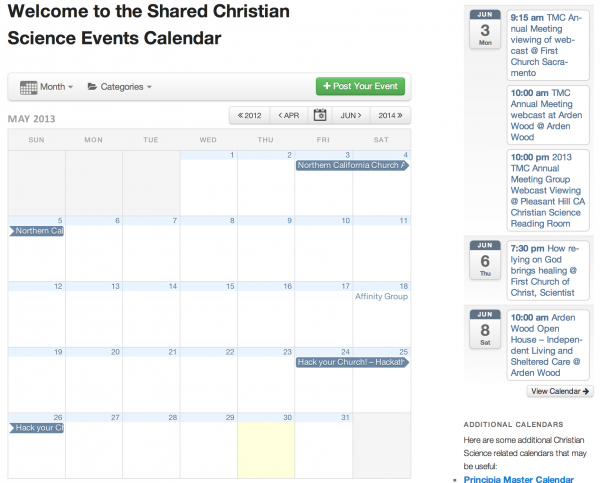 We’re pleased to be developing and hosting the new shared Christian Science calendar located at ChristianScienceCalendar.org. We announced the launch at the Northern California Church Alive Summit earlier this month, and already over 30 churches and organizations have signed up. We’re hoping to reach close to 100% participation, and are focusing on Northern California area churches to start, but plan to roll it out further as we can. Picture being able to open up your smartphone and reliably find upcoming Christian Science events near you. Pretty cool huh? That’s the vision. Want to be part of it? Sign up here.